Great Gatsby is, in our opinion, the very best theme for a 1920s party. The classic novel turned film epitomises everything that made the Roaring Twenties the best decade to be alive. Having performed at our fair share of Gatsby shindigs, we’ve picked up a few top tips on how to make the event the Jazz Age extravaganza it deserves to be. You’d think this would be implicit but don’t presume that your party guests are as stylish and fashionable as you. Don’t just reference the 20s in your invites – outline some of the styles you’re hoping for – short slip dresses with long lace gloves for women, trilby hats and dinner jackets for men. It is the best-dressed decade in history so make sure your party represents that. If you’re stuck for ideas, there’s some great blogs out there on the topic. Book the Gatsby Mansion. Okay, so that isn’t possible however do choose your venue carefully. Think art-deco, think opulence. If budget is an issue or you’re keen to host the party at your house then go all out on decorations. Think feathers, beads, golden curtains, flowers and art deco fonts. If you’re stuck for inspiration take a look at this Pinterest board. Think about the style you’re going for, make sure there’s art-deco fonts and artwork not just on your party decorations but also on your invitations. Everything related to your themed party should ooze Great Gatsby. If you’re not artistically inclined then consider a small investment on some decent invites from the online marketplace Etsy – there’s some real talent out there. Often the issue that many parties fall down on is the catering. 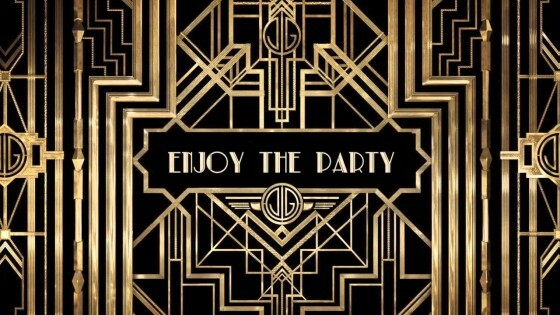 It’s not okay to host the most immersive 1920’s party experience and then serve cold pizza and warm wine! Instead, start thinking about the food to match the theme – think champagne in beautiful glasses, baked ham and gin aplenty! You can find great menu ideas here. We couldn’t help you to plan a Great Gatsby themed party without noting the importance of the music! In our humble opinion the best way to bring your theme to life and recreate the Roaring Twenties is with a live band like us. We’ll dress to impress and might even outdo some of your guests! We’re available to hire for performances across the country, so why not take a look at our song list today? And if you really want to revive the glitz and glamour of the era for your guests, why not consider our Flapper girls?